The overland journey from Chengdu to Shangri-La takes one from the megacity of Chengdu to mountainous Tibetan region of Kham. 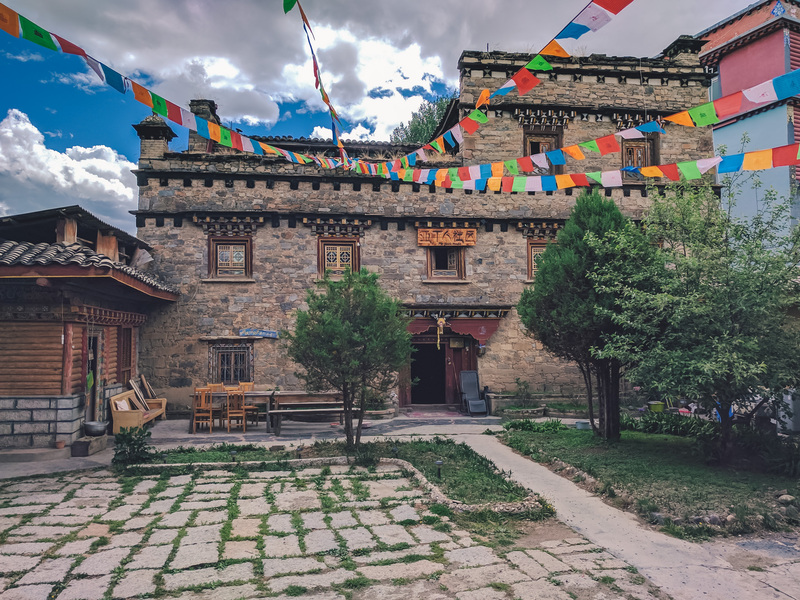 It is one of the most spectacular routes that I have ever travelled, and gives a look into Tibetan life without the restrictions that come with the Tibetan Autonomous Region. Time required: You should budget at least a week to complete this route, but if you have longer you’ll be able to check out more side trips. Be aware that delays in this region are frequent – an 8-hour bus ride can easily end up taking 15 hours. Historically Kangding was the gateway between China and Tibet, and it still kind of feels that way. Kangding is the largest city in Western Sichuan and is a great place to spend a few days. From Chengdu, getting to Kangding is simple. Most buses depart from Xinnanmen station and take 8 hours on a good day. Prices are around ¥120. The views during this journey are incredible. You’ll gain over 2,000 meters in elevation as your bus makes its way through incredible valleys and over high passes. Be sure to get a window seat! Kangding is home to one of my favourite hostels in China. When you’re here, I highly recommend staying at the Zhilam Hostel. Hike! There’s some great hiking nearby. Ask at the Zhilam Hostel for recommendations. I hiked up the mountain located behind the hostel, it offers some great views of Kangding. If you’re up for some coffee, check out Himalayan Coffee – great coffee and cheesecake (and the last decent coffee you’ll find until you get to Shangri-La). It’s a good idea to spend a couple of days in Kangding doing day hikes to help get acclimatized for the Tibetan Plateau. Litang sits at an elevation of 4000 meters, and is probably the closest thing to a Tibetan “wild-west”. Walk down any street in Litang, you’ll notice most local men wear cowboy hats and look 20 years older than they actually are. I decided to only stay one night in Litang. While the town has a lot of charm, there was major construction going on everywhere while I was there, which pushed my decision to move on. I had arrived in mid-afternoon, so spent the rest of the daylight wandering around town taking photos. Buses leave from the Kangding’s main bus station in the early morning and take around 9 hours. The ticket will cost about ¥100. Again, this is an incredible journey and you’ll gain another 1,500 meters in altitude. Window seat! I stayed at a hotel about 100 meters from the bus station as it was recommended in the Lonely Planet for its English-speaking owner. I discovered that the management had changed, and they no longer spoke English (they were still very friendly). Try to shop around find somewhere you like. Litang isn’t the most touristy place, so most hotels here will be fairly basic. Litang has a very unique vibe and just walking around the streets is enjoyable. 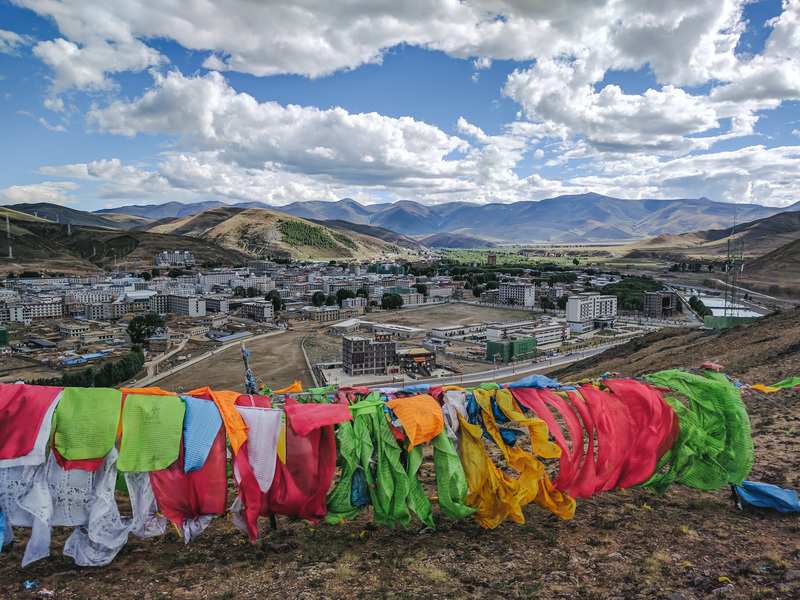 Check out the monastery on the north side of town, and if one is happening, you may be able to witness a “sky burial” out in the nearby grasslands. For dinner, I highly recommend Mr. Zhang’s restaurant, which is a fairly popular place among travellers who pass through Litang. I had some gong bao ji ding that was delicious! Mr. Zhang is very friendly and speaks a bit of English. 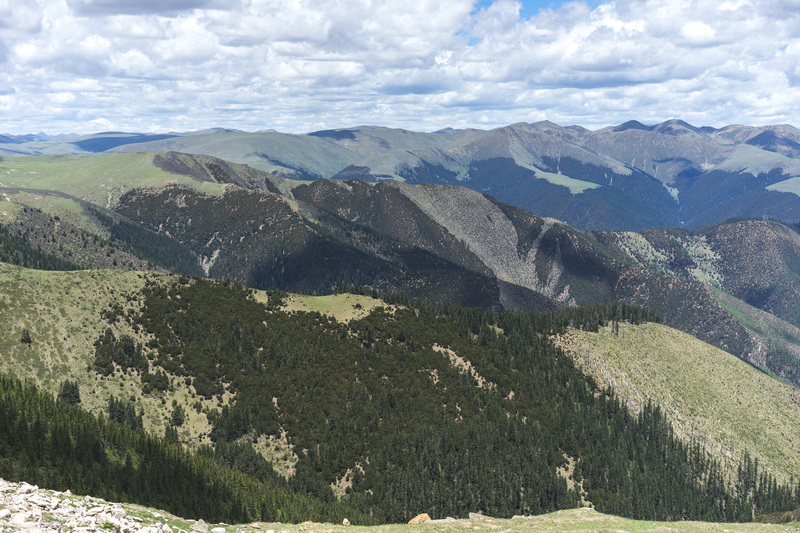 Sitting at 3750 meters above sea level, Daocheng is mainly visited by travellers on the way to the Yading Nature Reserve. It isn’t a terrible place to spend a night, however. There are minivans leaving from Litang frequently in the morning. The ride will take 3-4 hours and cost around ¥50. The road between the two towns is actually pretty good and mostly flat. I stayed at the Yading Backpackers International Youth Hostel and enjoyed it. They have a fluffy white dog that likes to hang out with guests 🙂 The hostel is in a very cool Tibetan-style building. I was only in Daocheng for one evening, so I climbed up a hill on the outskirts of town and watched the sunset. As far as I’m aware, there aren’t many other attractions. You definitely don’t want to miss the Yading Nature Reserve. Yading is one of the best places for trekking in China. There are a number of different hikes you can do in the area, ranging from 1 to 7 days long. I wrote an entire post about travelling and trekking in the Yading Nature Reserve. Check it out! Formerly known as Zhongdian, Shangri-La is the final stop on this route. The “old town” of the city burnt down in 2014, so it’s currently being rebuilt. From Daocheng to Shangri-La, the bus ride is about 12-hours and will cost ¥108. Check with your hostel/hotel and verify it’s departure time. 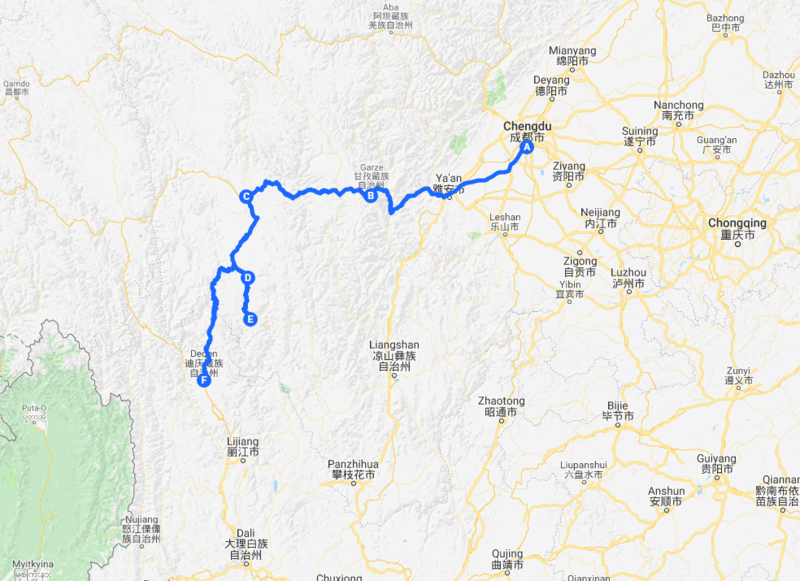 It’s an incredibly beautiful ride as you descend from Sichuan into Yunnan (seems like these incredible journeys are a common trend in Western Sichuan eh?). There are quite a few decent hostels here. I stayed at Tavern 47 and thought it was a great place. It’s in a traditional wooden Tibetan house and is very close to the main square of the Shangri-La Old Town. And that’s it! You’re now in Shangri-La and have all of Yunnan to explore next. Feel free to contact me with any questions, and let me know if you manage to travel the route! Planning a trip around China? Check out my 4-week China backpacking itinerary for some inspiration! Hey! Glad you found the post useful. I don’t recall feeling very unsafe on the busses, no memory of any speeding or anything. The entire road is paved, and there are barriers on the side of most of the road. I think it’s worth travelling the overland route rather than flying! The scenery is absolutely stunning, and will make up for any slightly sketchy driving (but I don’t think it will be a big problem).